Those are words I constantly refer to as a children's book writer. At school visits, I urge kids to dream big. When I speak at writers' conferences, I challenge attendees to dream big. During those many moments in which I am struggling with my own work, I push myself to DREAM BIG. Years ago--after a string of truly horrible picture book attempts--I wrote a story about a boy named Avery who didn't fit in at Cowboy Camp. It was the first time I had that heart-pounding YES! feeling about something I had written. I sent my manuscript Out There and received all sorts of responses. A few standard form letters. Form letters with actual ink-on-the-paper signatures. Many personal rejection letters, encouraging me to send more work. Three times the manuscript went to acquisitions teams. Oh, the joy! But no takers. Oh, the agony. But I didn't give up that dream. I believed in Avery and I believed in me. I pushed myself to send the manuscript Out There one more time. And it found the perfect home. This business is tough. But deep down (waaaaay deep down) I appreciate this fact. If it were easy to get published, that would take away from the thrill and the magic of the acceptance. We need to push ourselves. Quit playing it safe. Chase after what we want. Because sometimes the payoff can be amazing. 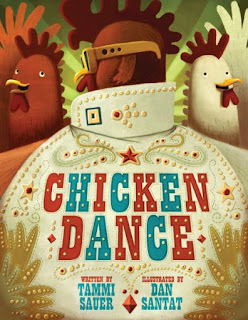 Tammi Sauer is the author of the award-winning humorous picture books Cowboy Camp (Sterling, 2005) and Chicken Dance (Sterling, 2009). Her forthcoming titles include the following: Mostly Monsterly (Paula Wiseman/S&S), Princess-in-Training (Houghton Mifflin Harcourt), Mr. Duck Means Business (Paula Wiseman/S&S), Oh, Nuts! (Bloomsbury), and Bawk and Roll (Sterling). In addition to writing, Tammi loves to read, ski, spend time with family and friends, go to the movies and eat out as often as possible. What is more, she is hopelessly addicted to checking her email. Tammi and her family live in Edmond, Oklahoma, with one dog, two geckos, and a tank full of random fish. Oh, and a giant Madagascar hissing cockroach. To learn more about Tammi, please visit her website at www.tammisauer.com. Thanks, Tammi, for sharing and to Lisa for the great interviews! Very inspirational words! Thanks for sharing, Tammi! Love this series, Lisa! I teach English in Montana and am on the State reading Council. We were having a meeting at the district level yesterday and were discussing an outreach program for teen moms. We purchased 25 copies of three books for the moms to share with their young children. Your book, Baby Can't Sleep, was one of them.